The site occupied by Fort McClary has been an important military defensive position since 1689, when William Pepperrell, a wealthy merchant and landowner, acquired a tract of land known as "Battery Pasture", which was adjacent to his own house. The first structures were probably simple earthworks and a small blockhouse, which was known as Pepperrell's Garrison, or Fort Pepperrell. Not until 1715 did the Colony of Massachusetts Bay vote to erect a permanent breastwork of six guns for the defense of the river. However, it may not have been until around 1720 that the fort was actually built. The position of a Naval Officer was also established, to collect duty from all ships entering the harbor, and to prevent New Hampshire's Naval Officer from extracting unreasonable duties. This money went to the purchase of powder and shot for the fort. The new fort was named Fort William, again after William Pepperrell, although some still called it Fort Pepperrell. When the Revolution broke out in 1775, the Pepperrell family still remained loyal to the British Crown. Local citizens confiscated all property belonging to the family, including the fort. The New Hampshire militia manned the fort until 1779, after which it was abandoned. In 1808 the State of Massachusetts ceded to the federal government 1.87 acres of land needed to build a new "Second System" fort. The new fort was named Fort McClary in 1808 in honor of New Hampshire native Major Andrew McClary, who was the highest ranking American officer killed at the Battle of Bunker Hill in 1775. The modifications included the rebuilding of the original breastwork into a large semi-circular granite wall (the Lower Battery), which was located at the foot of the central hill. There were emplacements for nine guns on the Lower Battery, along with a shot furnace. The Upper Battery was located at the top of this hill, upon which stands the current blockhouse. There does not seem to be any record of any guns mounted at the Upper Battery. Built behind the Upper Battery were barracks, Officers' quarters, a cookhouse with mess hall, and a powder magazine, all of brick. None of these buildings exist today, with the exception of the magazine and the foundations of the barracks. In 1844 the large hexagonal blockhouse that exists today was built, replacing the Upper Battery. Its foundation is mortared fieldstone, the first story walls are of cut granite, and the second and third stories are built of squared logs. A powder magazine is located in the center of the first floor. The upper stories were furnished for Officers' quarters. This was the last blockhouse built in Maine. Two brick Rifleman's houses to either side of the blockhouse were also built at this time. The one to the west, which was the smaller of the two, no longer exists. They were designed for flank defense by the infantry. Five 32-pounder guns and four 8-inch howitzers were emplaced at the Lower Battery during this time, replacing older smaller guns. In 1846 about 25 additional acres were purchased by the federal government, bringing the total land area close to its present size. After 1846 the fort was deactivated, and not until the Civil War began in 1861 was the fort again brought back to life. In the opening weeks of the war, the Maine Coast Guards and a 50-man company of the Kittery Artillery (mostly old men and young boys), commanded by Dr. Mark Wentworth, Captain, were sent to garrison the fort. Four 32-pounder naval guns sent from the Naval Shipyard were emplaced at the fort to bolster its defenses. The Kittery company was shortly replaced by a company from Biddeford, Maine. Battery B, 1st New Hampshire Heavy Artillery was stationed here from September 1863 to May 1864, until transferred to the defenses of Washington, DC. They returned to Portsmouth in November 1864. Because of the fear of Confederate naval raids, a massive refortification project was begun in 1863, to include a new large enclosed "Third System" fort with two tiers of casemates. If the modifications had been completed, the fort would have resembled Fort Knox and Fort Popham, located further up the coast of Maine. A caponier was constructed on the southern apex of the outer wall located at the river's edge. A bastion (mislabeled as a caponier on the state brochure) for flank howitzers was built on the northern apex of the outer wall, enclosing the garrison's well. A large granite powder magazine was built at the bastion. Another planned bastion at the northeastern apex of the outer wall was never built. A guardhouse and hospital were also built at this time, about 500 yards north of the blockhouse, which no longer exist. Several 250-lb (10-inch) seacoast Parrott rifles were added to the Lower Battery to keep the fort functional. Of historical note, then-Vice President Hannibal Hamlin enlisted in the Maine State Guards, Company A in 1864, and spent about three months at the fort as the company cook. Only one tier of the outer wall ever neared completion, and in 1868 all work was suspended. No new guns were ever mounted on the new work. Scores of cut granite blocks still lie in their positions on the ground to this day. 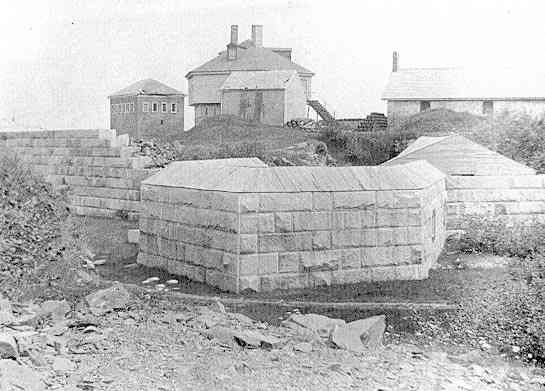 The old circular granite wall at the Lower Battery was modified into a broad earthwork in 1874, with three temporary wooden gun platforms. It still basically exists this way today. In 1890 nine 15-inch smooth-bore Rodmans, with seven iron carriages, were brought here and placed in storage, replacing the Parrott guns on the Lower Battery. These older guns were the only armament available to the fort during this time. 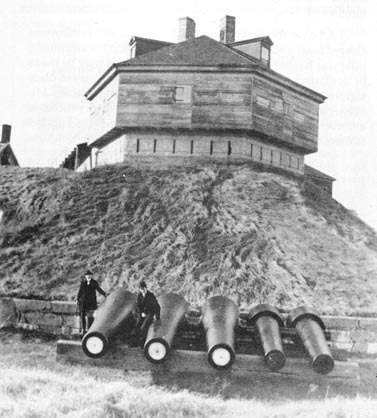 Three of the Rodmans were emplaced at the Lower Battery in 1898 during the Spanish-American War. The six additional Rodmans, with four iron carriages, were unmounted in storage, as well as two remaining 250-lb Parrott guns with iron carriages, until 1905. All were scrapped or sold by 1910. Many of the buildings began to fall into disrepair during this period. The fort was not garrisoned at all during this time, except briefly in 1898 with a detachment from Fort Constitution. A final small parcel of land was sold to the federal government in 1893. 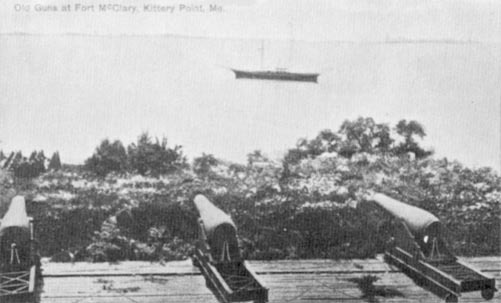 The three Rodman cannon emplaced at the Lower Battery, 1898. 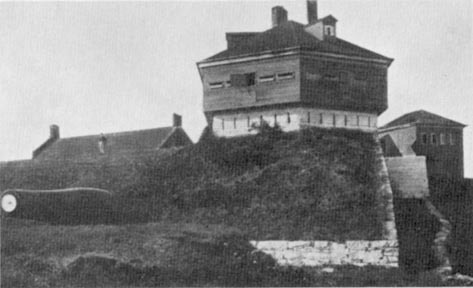 A Rodman emplaced at the Lower Battery, circa 1900.
showing also the blockhouse and barracks and other buildings. View of the fort, circa 1904, from southwest side. 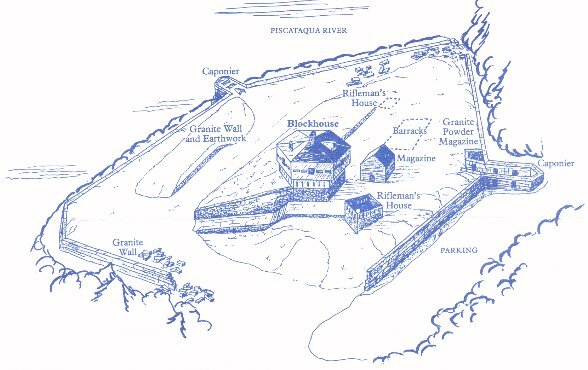 Note the barracks and second rifleman's house. Three 15-inch Rodmans and two 10-inch Parrott rifles dismounted, circa 1900. Of note - One of the fort's original Parrott rifles is presently located in Prospect Park in Ypsilanti, Michigan. and the WWI observation post atop the blockhouse roof. Map of the current layout of the fort. 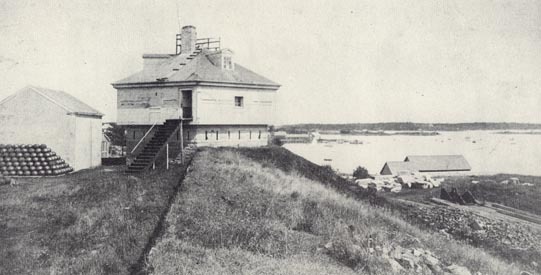 During World War I, as a subpost of Fort Foster which was built on Gerrish Island in 1899, the blockhouse was utilized as a lookout post, aiding Fort Constitution and Fort Foster for the defense of the harbor. In 1918 the fort was deactivated. In 1924 the United States transferred most of the property (25.58 acres) to the State of Maine, except for the original 1.87 acres containing the old buildings, which was not transferred until 1961 due to legal issues with Massachusetts. The buildings by this time had fallen into ruin. The second Rifleman's house was razed in 1928 for safety reasons. The barracks still existed at this time, based on photographs of the period. The Town of Kittery managed the park for several years until 1937, before the State of Maine took responsibility. The original plot still owned by the federal government was designated Fort McClary Military Reservation in 1937. From 1942-45 the blockhouse was again used as a lookout post by local Civil Defense units for spotting overhead aircraft and ships in the harbor. In 1969 Fort McClary was placed on the National Register of Historic Places. The blockhouse was refurbished in 1987. Admission is charged to enter the park. There is limited interpretation inside the blockhouse. The public parking lot is alongside the north outer wall. A publication titled "A History of Fort McClary State Historic Site", by Elaine Peverly and Sheila McDonald, may be purchased at the Kittery Historical and Naval Museum, located on Rogers Rd. next to the Kittery Town Hall. It is not available in most bookstores. Admission to the museum is charged. "The Friends of Fort McClary", a local preservation group formed in 2000, is dedicated to supporting recreation and historical interpretation at the park. Please send inquiries to Friends of Fort McClary, P.O. Box 82, Kittery Point, ME 03905. 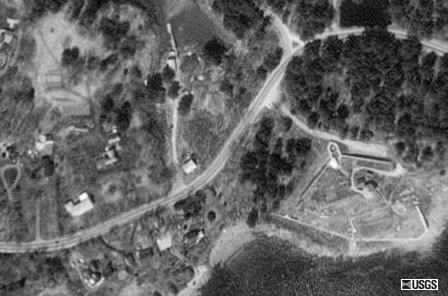 A 1992 USGS Satellite Image of the fort. NOTE: Strawbery Banke Museum images displayed on this page are to be used for non-commercial, personal, and private use only. Any other use, including publication, copying, or redistribution of said images in any manner is prohibited without prior written permission from Strawbery Banke Museum, Portsmouth, New Hampshire, and from American Forts Network.